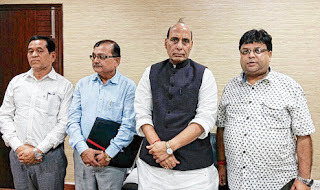 The Gorkha Janmukti Morcha today claimed that Union home minister Rajnath Singh had promised the party to hold a meeting on forming a committee to examine the demand of a separate state of Gorkhaland after August 15. Although the Morcha's claim couldn't be verified independently, it is not clear if the Centre will consult the Bengal government on forming the committee. Whether or not the Union government discusses the matter with Mamata Banerjee, there is every possibility of the chief minister fighting the panel tooth and nail. A delegation comprising Morcha general secretary, Roshan Giri, Kurseong MLA Rohit Sharma and the party's central committee member R.P. Bhujel called on Singh in New Delhi yesterday evening. "The Union home minister has assured us that a meeting will be held to discuss the formation of a committee to examine the demand of Gorkhaland after the Independence Day. We are hopeful that a positive decision will be taken on the committee formation," Giri said today. Asked about the details of the meeting, Giri said: "The meeting will probably be chaired by the Union home minister. We are not aware of the details of those who are expected to attend the meeting, but we have been told that such a session will be held post-August 15." The Morcha had made the same claim before also. After a Morcha delegation headed by Bimal Gurung had called on Singh in Delhi on November 24, 2014, the party said the Union home minister had promised to form a panel to look into the demand for Gorkhaland. But there was no development after that. During the Delhi meeting yesterday, the Morcha delegation also complained against the state's alleged interference in the functioning of the GTA and non-transfer of powers and function to the hill body. "Subjects like welfare of scheduled tribes and castes, backward classes and minorities are vested with the GTA as per Section 26 of the GTA Act. However, the state government has formed development boards outside the purview of the GTA (for different hill communities), which is a violation of the act," said Giri.